Unique, Nature-Inspired Sculpture For Your Home. You want unique works of art for your home but who has the time to search the internet, go to shows or meet interior designers just to see art you're not that excited about. You know what you love when you see it and you want to work with an artist that understands your unique style. I'd love to create something special for your home. Creating unique sculptural works of art that reflect the elegant beauty of nature for 25 years. Featured in some of the most beautiful mountain, coastal and city homes in the country and internationally. Award-winning design with an approachable, easy-to-work-with style that my clients love to refer to their friends. "From the moment we saw one of Matt’s beautiful, natural wall sculptures in a house on the Joy Garden Tour in Cashiers, NC, we knew that one of his designs would be a joy to have as part of our home. Fortunately, we had an ideal space for his work, and Matt custom designed a piece for us. Not only is he a creative artist, he is a kind and thoughtful man who listens. We feel fortunate to have such a lovely combination of art and nature to see in our home every day." Welcome! Matt Tommey is a world class artist and teacher working in Asheville, North Carolina's River Arts District. 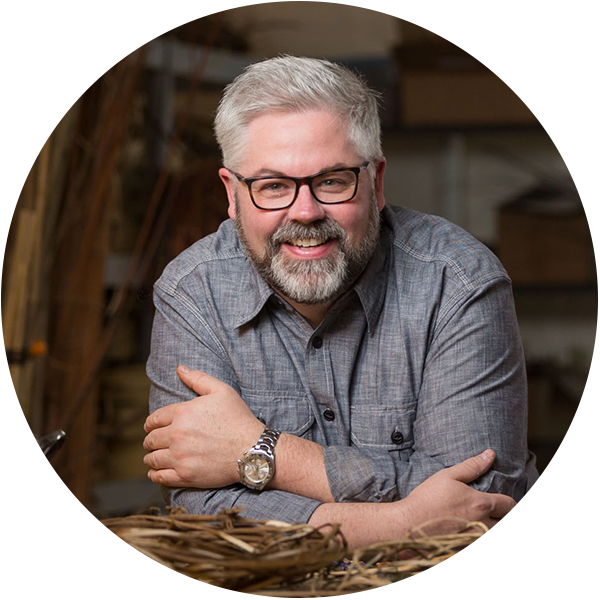 Since the mid-1990's Matt's been creating woven sculpture using basketry techniques for his clients that reflect the rustic elegance of nature. These days, Matt's woven art is featured in some of the most beautiful mountain homes in the country and is created from locally harvested bark, vines and branches. Whether you are looking for a special piece for your home or want to take one of Matt's basket weaving classes, you're in the right place! ​​​Get Matt's new book! Available now. Home is where the heart it is. It's where you rest, relax, play, entertain and enjoy the best parts of life. It's the place you look forward to coming to when life gets a little hectic and invite friends to retreat for the weekend. As the old saying goes, "there's no place like home." One of the things I hear from my clients over and over is how much they enjoy having pieces in their home that are one-of-a-kind and truly special. Maybe it's the walk in the woods we did together to harvest local materials from their property, knowing they had a hand in designing their special piece or simply knowing that each piece I create is unique. Either way, having my organic sculptures in your home adds to the already special aesthetic you've worked so hard to create. Beautiful interior design is all about the details. It's about the nuances of a room, the little surprises that meet you around every turn and how they all work together to support the overall design of a space. Using handcrafted, sculptural art baskets can accentuate the rustic elegance of your mountain or lake house while bringing the beauty of nature indoors. My woven sculptures aren't functional containers to hold your magazines. They go way beyond that. My creations push the lines between form and function, beauty and purpose. In fact, the purpose is the beauty. The beauty of a finely crafted sculptural basket or setting of multiple baskets nestled within laurel branches as an organic sculpture is unmatched by anything manmade. Rather, these sculptures are more uncovered and assembled than simply created. The come to life in your home and bring the essence of the natural world inside. When they live with you, they bring the serenity of nature into your world. With them, life is good. Take a moment to check out my current inventory of woven sculpture or find out how I can create something personalized for your home. I look forward to getting to know you! Interested in a piece or collection for your home? Call me at (404) 538-5173 or visit my studio and gallery in the River Arts District! I grew up in the deep south - Columbus, Georgia to be exact - and there learned to appreciate the simple elegance of nature. I played in the woods, rode 4 wheelers, made forts in the woods with my cousins and was always creating something from nature. A new wildflower arrangement, a rough vine wreath or just a collection of sticks and rocks all fascinated me as a teenager. My parents encouraged my creativity and it was during these formative years that I began to understand the connection of the words rustic elegance. When I got to the University of Georgia in the early 1990's after graduating from Young Harris College, I started working at the University Bookstore. There I found a book on basketry that grabbed my attention. The book focused on harvesting and preparing natural materials in basketry and something inside me said "YES!" I took the book home, started experimenting with kudzu and before long was making simple baskets and selling them to my friends and co-workers. I continued to create my baskets as a hobby for almost 15 years until moving to Asheville, North Carolina with my family in 2009. Shortly thereafter, my work began to be noticed by people who loved the simple rustic elegance of my work and I transitioned into art full-time. Since then, it's been a wild ride! I'm now teaching all over the country and even internationally at places like Arrowmont and the John C. Campbell Folk School in addition to some international locations like England, Scotland, Germany, Spain and Australia. In 2011 I was recognized by the Smithsonian American Art Museum's Renwick Gallery as an "American Artist Under 40". WOW, what a ride! So whether it was the sumptuous layers of color and texture in our family home, the 150 year old hand-hewn mill floors in my aunt's Atlanta mansion, basketry books I found "by chance" or just loving to walk in the woods as a teenager it all came together in me to inform my artwork and natural aesthetic. Nowadays, I am fortunate to work with clients who fully embrace this idea of rustic elegance in their homes. Some are very traditional and some are modern but all love that elegant touch of nature coming inside. They embrace fine interior design, beautiful furniture and artwork but at the same time want a little whimsy that really defines the southern elegance of living in the country. It's a little like Architectural Digest, Mountain Living, Veranda, Southern Living and Garden & Gun all rolled up into one. I love fireplaces! Most of the time in mountain homes, they are the focal point of the room. Beautifully stacked stones with rustic mantels. What's better? As beautiful as stone fireplaces can be however, I've heard from my clients that their fireplace mantel is one of the hardest spaces in their home to fill. Few people really know what to do with the space in order to make it shine and like it or not, it can be a problem space. When considering something for your fireplace mantel decor, I'd encourage you to consider one of my personalized fireplace mantel sculptures. I create these organic sculptures in all sizes based on your desires and of course the size of your room, mantel and fireplace surround. In addition, if you have property around your home which I can harvest from, I can actually come out to your place and harvest materials right from your property. This really makes your fireplace mantel sculpture special and something you can share with friends and loved ones for years to come. Find out more about commissioning me to create a special fireplace mantel sculpture just for you. Over my 20+ years of working with clients, one of the things I continue to enjoy most is the opportunity to work with clients to create unique organic sculptures for their home. Many times, some of my best ideas actually come from clients who start dreaming with me about their home and how my work could add that special touch of rustic elegance. When working with an artist like me to include sculpture art baskets in your home, remember I can create custom work specifically for your design needs or you can come to my studio / gallery and purchase right off the shelf. Whether something for the wall or pedestal, fireplace mantel or shelf, I'd be happy to help you incorporate my work into your own rustic home decor. 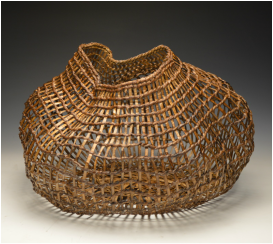 Find out more about commissioning a piece for your home or che﻿ck out﻿ my current inventory of sculptural art baskets.